Shipping Information: Free Shipping within India. Delivery in 10 to 15 Working Days. 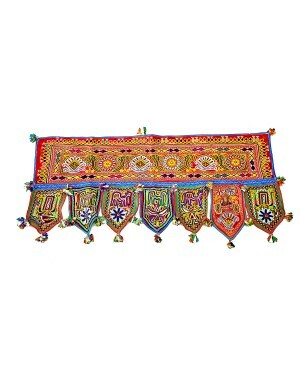 This wall hanging definitely is an exclusive choice for your home decor. It gives a regal touch to your home with this patch and embroidery work. It is also an ideal gift for several occasions such as Wedding Gifts, Corporate Gifts. Kutch Qasab and Crafts preserving art and culture of Kutch. Simultaneously rendering employment to many of the women through part time home jobs. Kutch, the largest of all districts in view of its area, situated in north of Gujarat state on the western direction of India, is famous for the art and culture all over the world. People from diverse communities and castes live in Kutch. The way of living and traditionality is also diverse. And therefore, by its prominent image, many tourists are attracted.Kutch Qasab and Crafts preserving art and culture of Kutch. Simultaneously rendering employment to many of the women through part time home jobs. Kutch, the largest of all districts in view of its area, situated in north of Gujarat state on the western direction of India, is famous for the art and culture all over the world. People from diverse communities and castes live in Kutch. The way of living and traditionality is also diverse. And therefore, by its prominent image, many tourists are attracted. • Disclaimer: This intricate home decor product is handcrafted and may have slight imperfection and/or mismatch from the product shown in the image as it is handcrafted by the artisan, which makes the product unique.